To use your own domain, you’ll need to purchase a domain name from a registrar like Ning Names, GoDaddy, Yahoo Domains or Register.com. Registrars are the behind-the-scenes traffic routers of the Internet, and they sell custom URLs, usually for a modest yearly subscription fee. Ning isn’t a registrar, but we do offer a service to help you purchase a custom domain name if you want to jump in without jumping out to somewhere else. You can search on Ning Names to see what names are available and find the custom domain that suits your fancy. After purchasing a custom domain, you’ll want to set up the appropriate DNS records on your domain registrar or host’s website. The basic thing to know about domain mapping is that you will be “pointing” your custom domain toward Ning’s servers. Once you’ve pointed your custom domain to our IP address (208.82.16.68), anyone who types in or clicks on your custom domain will be seamlessly presented with your Ning site in their browser. Voilà!… whateveryouwant.com. In order for domain mapping to work properly, you need a CNAME and A Record set up that points to the URL of your Ning Network ending in .ning.com. A CNAME indicates that a domain name (examplenetwork.com) is actually an alias for another domain name (examplenetwork.ning.com). An A Record points browsers to the actual server address to retrieve the data it will display (Ning’s IP address, 208.82.16.68). CNAME and A Record: What’s the difference? Tip: If you plan to use domain.com (without the www), you can simply create an A record and skip creating a CNAME. The alias for your CNAME record (or the host) will be the subdomain part of your domain (so in the above example, that would be “custom”). The alias for your A Record (or the host) will typically appear as @, which represents your custom domain. Tip: If you are currently pointing yourdomain.com elsewhere, you can simply create a CNAME record and skip creating an A record. First, set up the appropriate DNS records with your domain registrar or host. This may be tricky because different registrars provide different tools for managing DNS, and some don’t provide the ability to customize your DNS in the way that’s required for domain mapping to work correctly. Once you have your domain, you’ll need to set up a CNAME and an A record. If you plan to use www.domain.com, then create a CNAME to point to yourDomain.ning.com and an A record to point to our IP address (208.82.16.68). Sign in to your Ning Network as the Network Creator. Click on the Domain Mapping link. In the Alternate Domain 1 box, type the URL you purchased from your registrar. 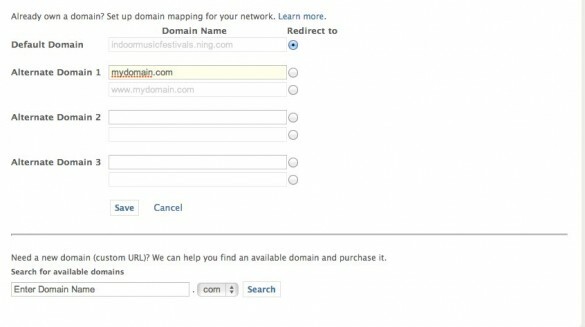 Select the button next to the domain name you want to appear as the URL for your network. Click the “Save” button, and you are ready to go! If you’re still unable to access your Ning Network through your domain mapped URL, check out our Troubleshoot Domain Mapping Issues guide.